Sweet local corn is suitable for any part of a meal. Try it in these salads. Sweet local corn, how do I love thee? Let me count the ways . . . For starters, you’re seasonal, abundant, fresh, and suitable for any part of the meal, from relishes and salsas straight through to dessert. 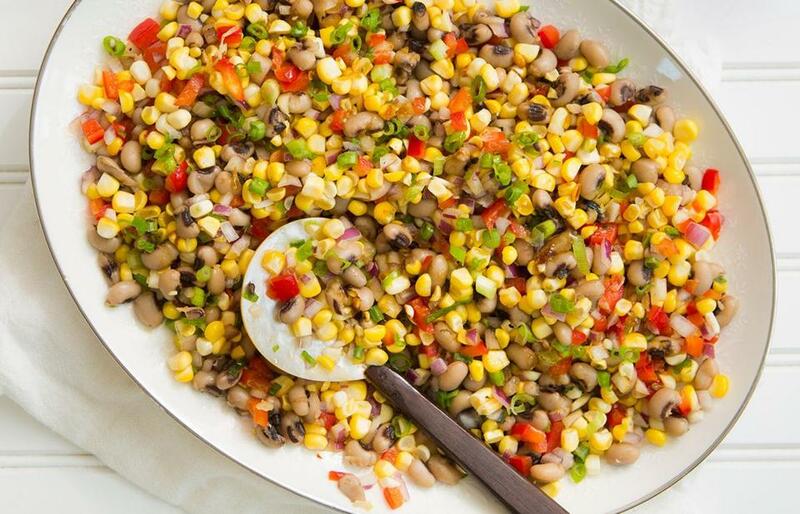 This week I focus on corn-based salads, one with black-eyed peas and two with shrimp. All three are satisfying enough for a light dinner or office lunch, but won’t leave you feeling weighed down. Enjoy them now, while the season lasts. 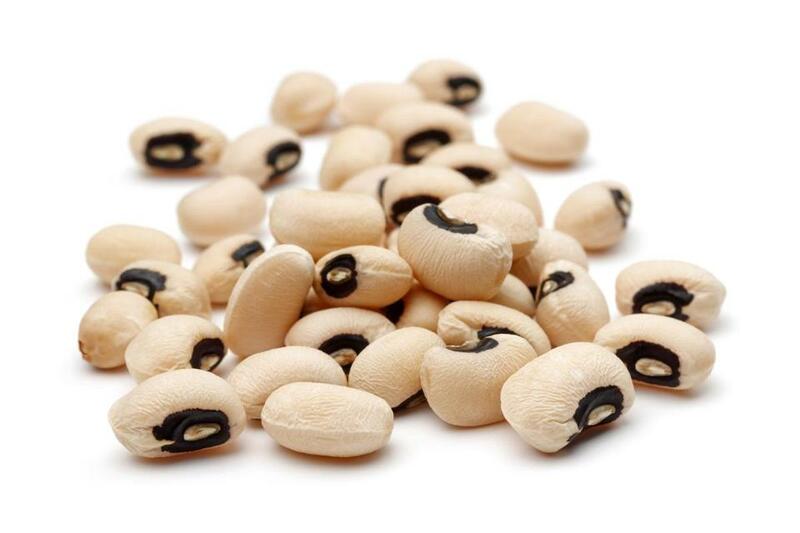 Canned or frozen black-eyed peas are fine here, but home-cooked beans will have an even better texture and flavor. In a small bowl, cover the onion with cold water and set aside for about 20 minutes; drain, dry well, and set aside. Meanwhile, in a large bowl, whisk the lime juice and zest, molasses, garlic, serrano chili, cumin, 3/4 teaspoon salt, and black pepper to taste to blend and dissolve the salt. Vigorously whisk in the oil to blend. Adjust the seasoning with salt and black pepper if necessary. Add the corn, black-eyed peas, bell pepper, reserved onion, and most of the scallions and toss to distribute. Adjust the seasoning with salt and black pepper, if necessary. Sprinkle with the remaining scallions and serve at once. This salad is terrific with grilled corn and shrimp. Place 4 cups cool water, 1 tablespoon lemon juice, and the shrimp in a large saucepan. Set the pan over medium-high heat and cook, stirring occasionally, until the shrimp are barely firm and just cooked through, and the liquid temperature reaches 170 degrees on an instant-read thermometer, about 8 minutes. With a large slotted spoon, transfer the shrimp to a bowl. When the shrimp are cool enough to handle, halve them lengthwise (you should have about 2 3/4 cups). Pour off any liquid accumulated in the bowl, cover, and refrigerate. Meanwhile, in a large bowl, whisk the remaining 1 1/2 tablespoons lemon juice, lemon zest, garlic, 1/2 teaspoon salt, and pepper to taste to blend and dissolve the salt. Vigorously whisk in the oil to blend. Adjust the seasoning with salt and pepper if necessary. Add reserved onion and shrimp, corn, celery and Old Bay; toss to distribute and set aside to blend flavors, about 10 minutes. Add the tomatoes and most of the parsley and toss to distribute. Adjust the seasoning with salt, pepper, lemon juice, and/or Old Bay, if necessary. Sprinkle with the remaining parsley and serve at once. Being relatively new to black-eyed peas, I was surprised to discover that they come not only in cans, but also frozen. In a quick side-by-side taste test, I slightly preferred the texture of cooked frozen black-eyed peas, though I’d certainly never hesitate to use canned if that’s what was available and easiest. If the spirit moves you, home-cooked black-eyed peas freeze well, too. Spread cooled beans on a parchment-lined baking sheet (so they won’t clump), cover with plastic wrap, and freeze. Transfer the frozen black-eyed peas to zipper-lock freezer bags for storage. In a large bowl, whisk the creme fraiche, yogurt, remaining 1 1/2 tablespoons lemon juice, lemon zest, vinegar, garlic, the larger quantity of herbs, 1 teaspoon salt, and pepper to taste to combine. Add shrimp, corn, celery, radishes, and shallots and stir to mix. Adjust the seasoning with salt and pepper if necessary. Sprinkle with the reserved herbs and serve.